Some time ago, Patrick Smacchia (NDepend lead developer) offered me a NDepend Pro license to play around. NDepend is a tool providing a lot of features. The feature that impressed me from the very start is visualizing dependencies. Not just dependencies from classes to classes, or assemblies to assemblies; no from everything to everything. Like for example all assemblies that use somewhere the method Foo of class Bar. It works for assemblies, namespaces, types, methods and fields. But, what’s all this fuss about? Keeping a code base and its design as simple as possible over a long period of time is very difficult. 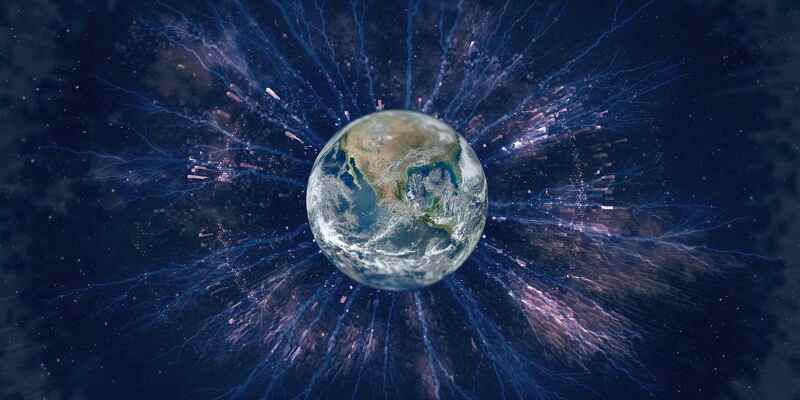 It happens just too quickly that we loose the overview of how things are sticked together. And this is the moment when NDepend with its quick and easy dependency visualization comes to the rescue. Now consider the scenario that I want to refactor the method ConvertToString(IEnumerable enumerable) in the class FormatHelper in the assembly bbv.Common. Direct and indirect usages of ‘FormatHelper.ConvertToString’ in the bbv.Common.StateMachine assembly. Box size equals the lines of code the box represents and edge thickness represents how many members of the dependency are used. This took me about 3 seconds and I get a nice overview where this method is used. Now I know that a change to ‘FormatHelper.ConvertToString’ may have an impact on all this methods. 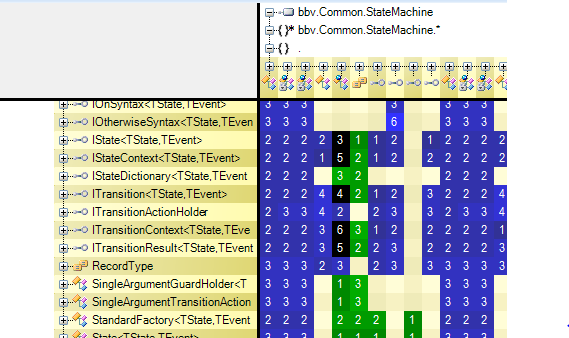 Namespaces of bbv.Common.StateMachine visualized with the NDepend Graph view. 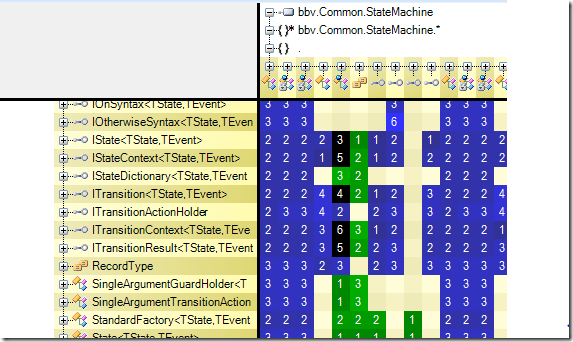 What immediately strikes the eye is the fat red arrow between bbv.Common.StateMachine and bbv.Common.StateMachine.Internals. That means, there are types in both namespaces that depend on types of the other namespace. A design smell for my clean code understanding. Dependency matrix of NDepend showing dependent elements: blue = element from top uses element on the left, green = element on the left uses element on top, black = both elements use their counterpart. NDepend helps to quickly get an overview of a code base and what depends on what. Especially for code that is worked on for a long time, this helps tremendously, to reduce complexity. I’m also a heavy Resharper user. Resharper offers itself navigation and simple visualization of dependencies. However, NDepend delivers you the information needed to start untangling dependencies faster and with more easy. Why I like … posts are not about a tool or process being better that others, it’s just my thoughts what makes them useful for me in my projects. We really have to spend more time digging into NDepend. What do you mean with Resharper simple visualization of dependencies? I can’t find such feature. I mean the features in the “Inspect” menu of ReSharper.